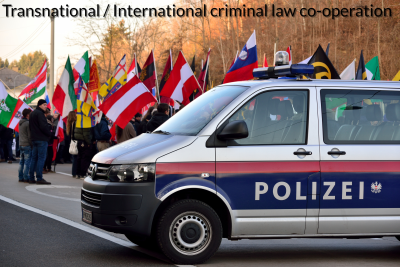 Given the jurisdictional complexities of transnational criminal justice there is a heavy reliance on cooperation between nation states in order to overcome these extra-territorial hurdles. The interconnected nature of the world today has created close law enforcement cooperation between Australia and multiple foreign law enforcement bodies in order to overcome the investigative challenges that transnational crime poses. The extent of such cooperation is evident through the AFP guidelines on international police-to-police assistance in death penalty situations. Authority to provide assistance and cooperation with foreign law enforcement agencies is granted in accordance with the Australian Federal Police Act 1979 (Cth). Assistance by the AFP before the detention, arrest, charge or conviction requires a senior AFP management (Manager SES0Level 1 and above) considering certain prescribed factors before approving the provision of assistance in matters with potential death penalty implications. Any assistance required after the detention, arrest, charge or conviction of an accused person requires ministerial approval. What is the Approval Process for AFP assistance in death penalty offences? A case example of cooperation in transnational criminal justice is the Australian Federal Police providing frontline assistance to the Royal Papua New Guinea Constabulary (RPNGC). The PNG Annexure to the National Guidelines, entitled ‘Application of Whole of Government Death Penalty Framework to AFP ‘Frontline Advisory’ Deployment to PNG’ establishes the government approach to managing death penalty issues in PNG for the AFP (International Deployment Group) officers deployed to Papua New Guinea (PNG). What type of training can the AFP give to the RPNGC? ‘In situ training’ (pre and post arrest) – Regardless of whether a person has been arrested or detained on suspicion of having committed an offence for which the maximum penalty is death, the AFP can provide ‘in situ training’ (for example, at a crime scene) without requiring approval. In these situations, the AFP is required to ensure a written record of such assistance is recorded. Can the AFP affect an arrest transnationally? The AFP is permitted to arrest without a warrant to assist the RPNGC. However, such authority is granted only in exceptional circumstances. Such circumstances will extend to when an alleged criminal act takes place in the presence of an AFP Appointee or there is a serious threat to the safety and security of other persons, including AFP Appointees.